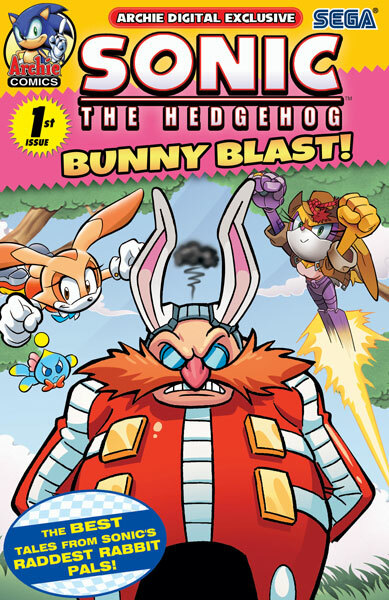 Yesterday, Archie Comics released an Easter themed Sonic comic compilation for sale at its iVerse Media fueled digital comic book stand. The special issue, appropriately enough, focuses on tales starring Bunnie Rabbot and Cream the Rabbit. You can also see from the artwork above that a special piece of artwork graces the edition, but that appears to be the only portion of the release that’s new. It’s not free, either; be prepared to shell out a couple of bucks if interested. The issue can be purchased and downloaded via the Archie Comics iVerse Media app or the separate Sonic comics app.